less 522nd Field Artillery Battalion). The 522nd Field Artillery Battalion participated in the Central Europe Campaign from March 22, 1944 to May 11, 1945, when they were detached from the 442nd Infantry Regiment. The 522nd Field Artillery Battalion supported the 63rd Division in their assault on the Siegfried Line, the 45th Division, and the 44th Division in their drive for Mannheim, Germany. They eventually supported the 4th Division's drive on Salzburg, Austria. During the Central Europe Campaign the 522nd liberated one of the slave labor camps of Dachau. The Anti-Tank Company of the 442nd RCT participated in the Southern France Campaign from August 15, 1944 to September 14, 1944, when they took part in the D-Day Invasion of Southern France (Operation Anvil). There they dropped into France on gliders and took up defensive positions in support of the 517th Parachute Infantry Regiment. They later rejoined the 442nd RCT in the Vosges Mountains. The battle history of a military unit must be recorded and created. The U.S. Army gave the Japanese American soldiers of the 442nd Regimental Combat Team and the 100th Battalion ample publicity through press releases, newsreel films and photographs. 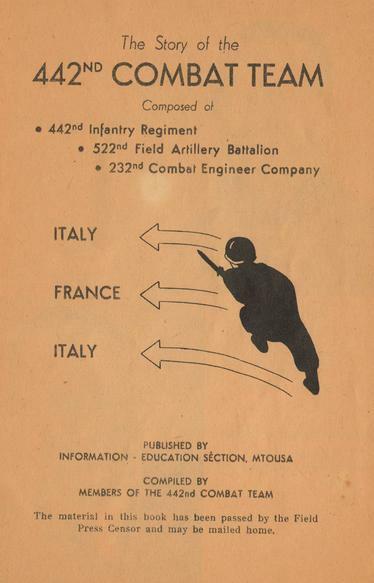 At the end of the war the Information-Education Section, Mediterranean Theater of Operations, U.S. Army, produced a short history of the 442nd. 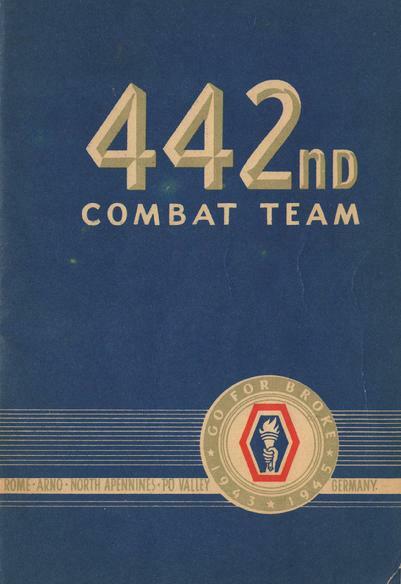 The title of this pamphlet was The Story of the 442d Combat Team. 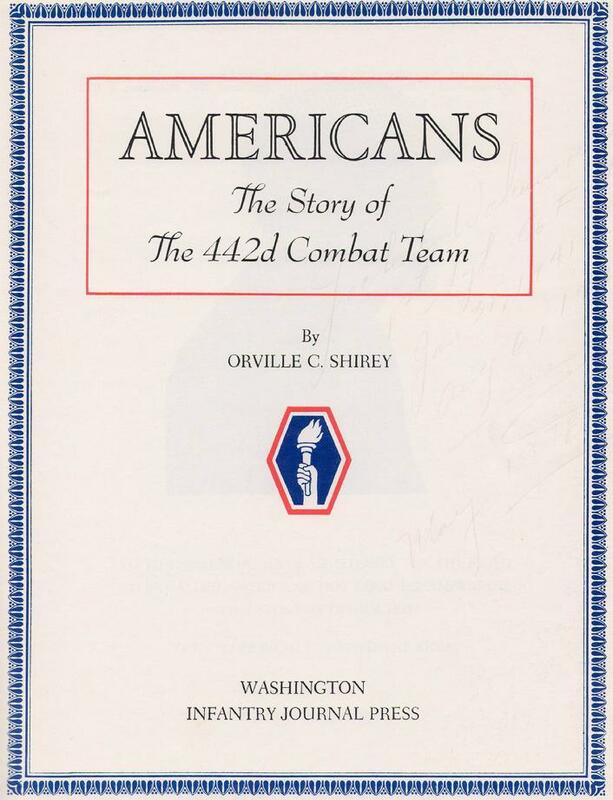 Orville C. Shirey wrote the unit's "official" history titled Americans, The Story of the 442d Combat Team which was published in December 1946. This letter from the Assistant Secretary of War John J. McCloy's office to General Surles (director of War Department's Bureau of Public Relations) gives an indication of the War Deparment policy for publicity of the newly formed 442nd Regimental Combat Team, 100th Infantry Battalion and the Military Intelligence Service Language School. The Assistant Secretary of war's directive mentioned in this letter has not been located in the Archives, but this letter is consistent with the publicity that the 442nd RCT, 100th Battalion, and Military Intelligence Service received during and after the war. Please note the attached confidential file and the Assistant Secretary of War's directive attached thereto. 1. That no publicity be given to the (Japanese) Military Intelligence Service Language School. 2. That the high morale, excellent conduct and other favorable features pertaining to the Japanese American soldiers located at Camp Savage be publicized. (Paragraph 1 b of Recommendations). 3. 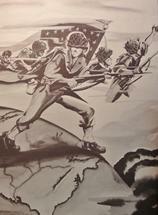 That full publicity be given to Japanese American Combat Team (442d Inf, 522d F.A. Bn, and 232d Engr. Comb. Co.) now stationed at Camp Shelby, Mississippi, and to the 100th Inf. Bn (Separate) (Japanese American). Request that this file be returned after it has served its purpose. File on publicity in regard to JA soldiers in the Army. TOPSEC from Marshall to Devers for his personal attention. Operations reports show the 442nd Infantry and the 100th Battalion Japanese in action on the 5th Army front against heavy resistance. If military reasons do not preclude, it would be beneficial to give publicity to aggressive action of these Japanese troops. It has tremendous value, not only from the propaganda side, but helps materially in our handling of the American-of-Japanese-descent problem in this country, particularly on the west coast. Devers from AFHQ Adv CP to for action AGWAR for info AFHQ. Have arranged for release of publicity on Japanese Units with 5th Army. Your W 57243 refers. Have special photographers and writers at the front now. I refer to your recent letter regarding publicity to be given to the 442nd Combat Team upon its arrival in a theater of operations. I have just been advised that action has been initiated in the theater to obtain full press, still, and newsreel coverage of both Japanese American units now overseas. Several top writers have been assigned to features and stories on these units, and in addition the Army Pictorial Service now has crews at the front with these units. Files will be completed and shipped within the near future. The press release line on these units has been lifted so that newspaper and radio coverage may be obtained of current operations.